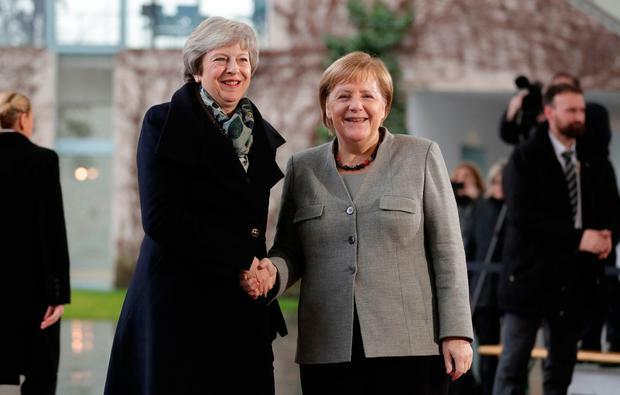 Prime Minister Theresa May sought Angela Merkel’s support on Tuesday to save her floundering Brexit deal but the European Union ruled out renegotiating the divorce treaty, after May postponed a parliamentary vote she admitted she would lose. Less than four months until the United Kingdom is due to leave the EU on March 29, May warned British lawmakers that if they rejected her deal then the only other options were a disorderly no-deal divorce, or a reversal of Brexit that would defy the will of those who voted for it. A day after pulling the vote in the face of hostility from lawmakers, May rushed from London for breakfast in The Hague with Dutch Prime Minister Mark Rutte and then a meeting in Berlin with Europe’s most powerful leader, German Chancellor Merkel in a frantic bid to save her deal. The message from the EU was clear: It will give “clarifications” but will not countenance reopening the treaty. In rainy Berlin, a hitch with May’s car door briefly trapped her inside, delaying her red carpet handshake with Merkel. The British parliament will vote on a deal before Jan. 21, May’s spokeswoman said. If there is no satisfactory deal by then, parliament will still be given a debate on the issue. The British pound, which has lost 25 cents against the U.S. dollar since the 2016 referendum, was up 0.4pc at $1.2615, a recovery of sorts after falling 1.6pc on Monday. The most contentious issue has been the Irish “backstop”, an insurance policy that would keep Britain in a customs union with the EU in the absence of a better way to avoid border checks between British-ruled Northern Ireland and EU member Ireland. May’s critics say it could leave Britain subject to EU rules indefinitely. Juncker said neither side intended for the backstop ever to take effect, but it had to be part of the deal. May, due to meet Juncker and European Council President Donald Tusk later, said she would seek further assurances and ways to give British lawmakers powers over the Irish backstop. May pulled the parliamentary vote the day before it was due to take place on Tuesday, prompting ridicule, calls for a national election and blunt warnings her eleventh-hour bid for changes was in vain. She said the deeper question was whether lawmakers wanted to deliver on the people’s will expressed in a 2016 referendum, or open up divisions with another national vote. With little hope of substantial changes from the EU, the options open to Britain range from a chaotic Brexit with no deal to risking the wrath of pro-Brexit voters by calling the whole thing off. Both May’s ruling Conservatives and the main opposition Labour Party have pledged to implement the results of the 2016 referendum in which British voters backed exiting the EU 52pc to 48pc. But three out of four living prime ministers and a growing chorus of backbench lawmakers say a new vote is the only way out of the impasse. Among Brexit opponents there is mounting enthusiasm for a chance to have another say.